This ostentatious ornamental is known by quite a variety of nicknames. 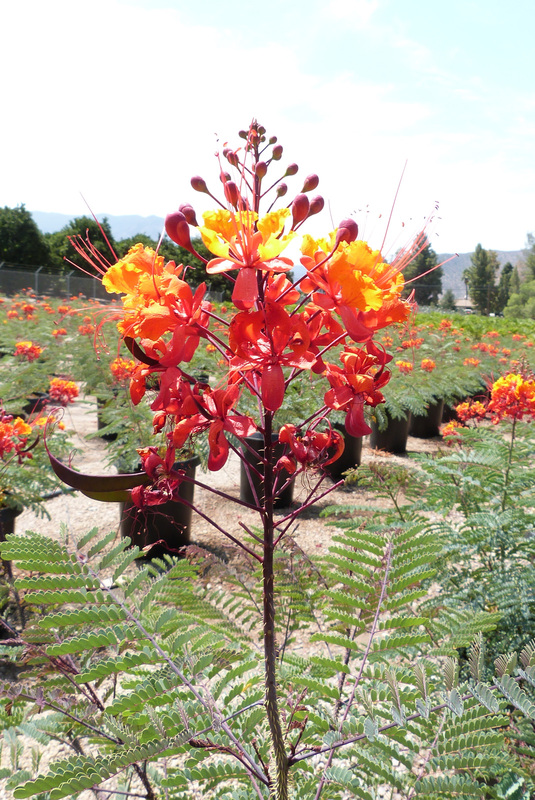 Among them, Mexican Bird of Paradise, Red Bird of Paradise, the Pride of Barbados, Peacock Flower, Dwarf Flamboyan, Caesalpinia, flamboyant-de-jardin, and Dwarf Poinciana. It’s native to the West Indies but grows quite commonly in California as well as in Texas, Florida, and Arizona. It thrives in heat and, once established, is drought tolerant. The most pulcherrima (latin for “most beautiful”) part of this plant is its bright red, orange, and yellow flowers.